As the numbers of police in our schools steadily increase, so do the disproportionate rates of discipline against girls of color. In recognition of this reality, Georgetown Law’s Center on Poverty and Inequality and the National Black Women’s Justice Institute conducted focus groups and interviews primarily in the South with girls of color and police officers to gather first-hand information about their interactions. 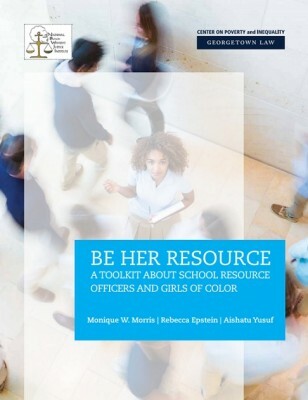 Based on this work, this toolkit provides guiding principles and policy recommendations that are designed to improve interactions between girls of color and SROs, with the ultimate goal of reducing these girls’ disproportionate rates of contact with the juvenile justice system. This FACT Issue Brief identifies forms of family violence and abuse faced by older adults and summarizes research on effective ways communities and households can identify and prevent further abuse. Promising strategies designed to protect the safety and security of the older adult population within the Commonwealth of Virginia are highlighted.